Now here's a sale we haven't seen in a long time. 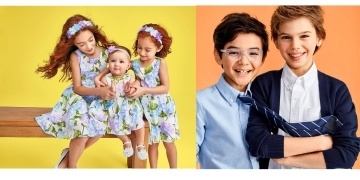 Weekend Wow deals are back at Carter's Canada! And for a limited time, you can score clothes for up to 50% off. Here's how the deals break down. Select new swimwear is 30% off, OshKosh jeans are 50% off and select styles are as low as $7. So basically, you can pick up just about anything your kids might need for summer at a fraction of what they would usually cost. And seriously, how adorable is this sweet, little 2-Piece Swimsuit & Cover-Up Set? It's sized for baby girls (from NB to 24M) and now only $23.80. Just remember that, since these deals won't last much longer! Shipping is free on orders over $50.